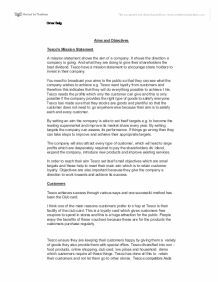 Aims and Objectives Tesco's Mission Statement A mission statement shows the aim of a company. It shows the direction a company is going. And what they are doing to give their shareholders the best dividend. Tesco have a mission statement to encourage shareholders to invest in their company. You need to broadcast your aims to the public so that they can see what the company wishes to achieve e.g. Tesco want loyalty from customers and therefore this indicates that they will do everything possible to achieve this. Tesco needs the profits which only the customer can give and this is only possible if the company provides the right type of goods to satisfy everyone. Tesco has made sure that they stocks are goods and plentiful so that the customer does not need to go anywhere else because their aim is to satisfy each and every customer. By setting an aim the company is able to set itself targets e.g. to become the leading supermarket and improve its market share every year. By setting targets the company can assess its performance. If things go wrong then they can take steps to improve and achieve their appropriate targets. The company will also attract every type of customer, which will lead to large profits which are desperately required to pay the shareholders dividend, expand the company, introduce new products and improve existing services. In order to reach their aim Tesco set itself small objectives which are small targets and these help to meet their main aim which is to retain customer loyalty. Objectives are also important because they give the company a direction to work towards and achieve its success. Customers Tesco achieves success through various ways and one successful method has been the Club card. I think one of the main reasons customers prefer to shop at Tesco is their facility of the club card. ...read more. Tesco sells a wide variety of foods and drinks, in all kinds of sizes, such as small size, medium size, family size and etc. The reason Tesco sells such a large variety of foods is to satisfy the customer needs, making it convenient for everyone. They also sell a variety of different company brands. They have even got their own brand of products known as Tesco Value', which helps Tesco to compete and overcome its command Tesco Finest' competitors as it provides for all three different types of classes, the rich, the middle and the poor. By doing this Tesco gets repeat business, and turns potential customers into loyal customers. Which means that they will accomplish their mission statement so will also achieve their aims and objectives. Tesco's sales have risen steadily to success, as the firm is the UK's largest food retailer. The food industry is a massive industry in the UK and is a highly competitive market with very low profit margins. To be precise this profit made by Tesco was more then Next, WH Smith, Mark & Spencer and Sainsbury. This all goes to show how good Tesco really did in achieving their aims and objectives of overcoming competition. One of Tesco's aim changed as organic food became the latest fashion and trend, Tesco realised this and wanted to capitalise on it. The way in which they did this was by increasing their range of organic foods by increasing the number of aisles with organic products on them. Along with organic food the trend changed into Asian food products. Tesco responded to the desires of the customers and have began stocking a wide range of Asian products allowing customers to buy everything under one roof, and not needing to go to small corner shops. Tesco Business Activity Tesco's main business activities are buying and selling in the food and non-foods sector. ...read more. He must be very careful with his prices and ensure to charge a competitive price which is neither too high or to low. He must also insure that he meets the customers requirements and to keep up to date with fashion and latest trends. The type of customers he gets are mainly female who look for wigs, cosmetics and beauty products however he also attracts a number of boys and hairdressers who are interested in gel who appreciate his services a great deal. However, he must also ensure that he keeps his shop up to a high standard meeting the hygiene requirements therefore he must keep it clean ant tidy. He also has a radio set up in his shop to keep the customers from getting bored while doing their shopping. All2One have a certificate on the shop front to show that he is a professional and that he is qualified so that he is able to promote his business. Being a single owner of the business requires him to be fully focused on the business which reduces the time that he is able to take of work. This is why his supplier delivers products to the shop every week to save time to deal with customers. When a customer spends over �15 at his shop he offers a discount to retain these customers. All2One have been opened for 6 years and they are a well known business. When he decided to open their was only one shop in slough that offered these type of products but offered a small variety, hence he decided to open it but offering a larger variety. Three years after he had opened another shop offering the same type of products nearby. This meant he had competition which forced him to reduce prices to retain customers. Now that there are two competitors close to his business he has to ensure that he does not lose any customers otherwise he will be in great havoc which would cause him to go bankrupt. Omer Baig ...read more. This will be done through administration. Tesco's admin team also deal with complains and letters that people/customers write in. (This is now done usually in eMail although the occasional letter may arrive). * IT support o For their website: Tesco.com they will need IT support technician to manage and keep the website up to date. The place is about distributing a product or service from a manufacturer to the customer and must be convenient and quick for the consumer. The Promotion is the brand awareness using methods of communication to promote consumers' interest in product or service. ways to increase that, to gain more profit Tesco has to reduce its cost and also increase its revenue. For higher revenue Tesco can purchase their stock from a different supplier for less and to increase the profit Tesco can also put on higher prices on each item. Within Tesco, HR department would take care of the customer services and all the enquirers the customers have. The HR department covers the policies and studies section, and this would include job specification to new employees. The HR department would also be the first point of contact for the customers, for example if they where applying for a job. Why or why not? Answer 2. Bert and John?s managerial style is managing people who take action. It can work for other organizations as well. For Bert and John, they set up the motto and enhance the company?s culture to let employees feel themselves to be constructive parts of the company. Revenue per employee14 170,923 177,084 179,840 196,4363 196,120 Profit per employee14 10,190 11,292 10,81419 13,0653 14,303 Weekly sales per sq ft15 25.06 25.48 25.43 25.343 25.22 http://www.tescoplc.com/plc/ir/financials/fiveyearsummary/ ?In Tesco in the UK, there is only a 2% difference in pay between men and women. Similarities & Differences of McDonalds & The NHS McDonalds The NHS Ownership Private Limited Company & Franchises State Owned Size Large Large Scale Global National Sector of Industry Primary, Secondary & Tertiary Secondary & Tertiary Sector of Business Private Public Business Purpose To make money.